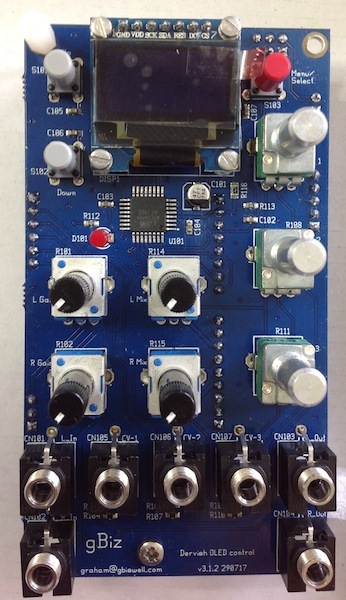 Dervish: fx module based on the Spin Semiconductors FV-1 DSP. See this doc for links to all the docs, BOMs. Schematics will be emailed to you when you purchase boards. See the next post for example sound clips. The FV-1 provides three control voltage inputs. Dervish provides summed pot & external CV for each of these. External CV range is +/-5V with the corresponding pot centred. I provide an EEPROM image that you can use immediately containing compiled versions of the algorithms available from Spin Semiconductor under their open reverb license. 0.96" 7-pin SPI OLED display. The main runtime display shows the current effect's bank name, effect name, labels for the three CV's function (see image above). A menu provides options to select new effect bank, set optional display screensaver timeout & change display brightness. Width: Display board is 12HP, DSP is 8HP. Current draw (measured with a long reverb program running): -12V: 26mA. +12V: 100mA with display at full brightness, most characters displaying, 92mA with display blank. Varies by a few mA depending on the program running, reverbs seem to be worst. I can supply: PCBs; PCB panel + window ; FV-1 DSP ; Tall Trimpots ; pre-programmed ATTiny & EEPROM. See "Ordering" section at bottom of this post for details on pricing, shipping etc. Mouser carts for the rest of the components. Edit: As of Apr 2019 I've stopped supplying the OLED display. The current ATTiny code should support any 7-pin 4 wire SPI 0.96" SSD1306 compatible display, so source this from ebay/Ali or one of the more "reputable" suppliers. I currently still have M2 mounting hardware available, i'll bundle that in with the panel. Build guides & BOMs are available for all the boards. All the ICs are SOIC, so easy enough to solder. The passive components are 0603 SMT. Anyone who's successfully built one of the Mutable boards shouldn't have any difficulty with this. I have pre-programmed ATTiny & EEPROM available if you want to avoid flashing these devices. With these once the module is built & working, thats it, it's a working module. You don't need to do any programming unless you want to do some customisation of the program banks etc. Alternatively, for those willing to do the programming themselves, i provide binaries for both the ATTiny & the EEPROM image, along with full source code. I supply a "programmer shield" PCB as part of the PCB set that converts a standard Teensy3 into a programmer suitable for programming both the ATTiny & the EEPROM. I also provide the binaries of the sketches for this. If you don't plan to do much programming with Dervish, you can re-use the Teensy3 once you're done for something else like o_C, Orgone Accumulator, Radio Music. The control/display board has a standard 6 pin ICSP header to upload code to the ATTiny. You'll need a suitable programmer (I use an Olimex AVR-ISP MK2). If you don't have one, the i2c EEPROM programmer shield provided as part of the PCB set can be used. Just load the Teensy with the supplied ArduinoISP sketch first. The DSP board has an i2c header that you use to program the EEPROM. This i2c bus is also connected to the FV-1 & the ATTiny. The FV-1 isn't tolerant of voltages above 3.3V on it's i2c pins, so any i2c programmer you use must provide 3.3V signals else you'll kill the DSP. Code to interface into this EEPROM programmer from your desktop is provided for Linux & MacOS. Windows users are recommended to use a Linux image running in Vagrant and use the Linux code. I've written a progamming environment that when used in conjunction with the Teensy "eeprom programmer" shield & companion sketch, allows you to upload/download EEPROM images, program banks or individual program binaries into Dervish. This environment is written using standard Unix tools, so whilst it runs on MacOSX and Linux, it cannot be easily ported to run natively on MS Windows. Windows users are recommended to use Linux hosted in Vagrant (this is easier than it sounds, i have a basic doc on how to set this up). I also provide a simple assembler that means you can use this environment as an FV-1 development system. The programming environment has a full users guide, and for those unfamiliar with the command line interface, an installer script. I2C & 3x attenuverters (4HP): Useful if you do a lot of FV-1 programming. Keep the Dervish in the rack. Plug the EEPROM programmer into this module. The i2c from this module plugs into Dervish. UpDownTap (2HP): Provides external control of program up/down, and a basic pushbutton for use with tap tempo programs. See this page for prices, options etc. Built modules are occasionally available from me, free time permitting. Please PM or email me for details. There are other builders who can also provide built modules for customers. * Elements with various reverbs, no Elements builtin reverb used. (I know i could use the embedded soundcloud & yt options, it takes too long to load IMO). looking good! I'll take a set when available. interested for the future, but will hold off for now due to huge backlog. but given how many folks seem interested right off the bat I would suggest looking into getting your PCBs done somewhere other than OSHPark. its great for small runs and proto, but if you are going to bother doing larger batch production rather than just sharing project files you could probably get much better pricing per-unit from somewhere else. My reason for sticking with OSHPark, i'd know the boards would be same as ones i've tested. But others have suggested the same as you, so i'm looking at alternatives. Just for reference, OSHpark are ENIG (aka immersion gold) plated. Decent for leaded or unleaded solder. Avoid the silver stuff (IAg), tarnishes quickly and hard to solder to. The calibration for external cv is located into the code? I'm not sure what you mean by calibration ?. I have no objections to lead. Looks like PCBWay are trialling ENIG. They had an option for it, supplied at their discretion, with HASL if you don't get it. I'll jump on the list too! I'd be down for a PCB set, and panel probably too. Ah yes. Panel. Not something i've ever really done properly for my own designs before. Cost of decent metal panels from FPE/Schaffer coupled with a likely hit for UK import duty always put me off. I've never been a massive fan of acrylic or PCB panels. I can live with a rough looking DIY panel that i've done. But i suppose this one should be done properly. I already have .dwg & .svg files that i used as drill templates to create the panels i'm using now. And i've put together a PCB layout for a PCB panel, though that needs some graphics for the text. So most of the hard work is done. I'll include both in the upload to github. do you have a link to your github please? I'm in for PCB's and a panel if it gets offered! I'll upload to github once i'm happy the current gerbers don't require rework. I'll add a link to it in the OP then. When that happens depends on when i get my latest prototype PCBs back from OSHPark. So happy to see this is happening, Good skills gbiz ! I'm not sure what you mean by calibration ? Ah sorry! I want to use the cv inputs with a 0/10v signal. So maybe i could shift the -5/+5v? Ah, i see what you mean. (I had visions of you wanting to calibrate it to a nicely linear 1V/Oct ). The +/-5V CV input provides full voltage swing at the FV-1 POT input with the corresponding control pot centered. You can get a similar full swing with a 0-10V CV with the control pot fully counter-clockwise, but then you lose the ability to set a offset with the control pot & drive the POT input in a negative direction with the CV. Theres no way round that in the module unfortunately, at least without some rework. You'd need external voltage processing of your CV. Attenuverters & level shifters work well with these CV inputs. I did think about adding them. But the panel would have ended up at 16-20HP. There's probably the case for a 8HP companion module for this that provides attenuverters, level adjusters for the CVs, input mixers that make it easier to add feedback etc.